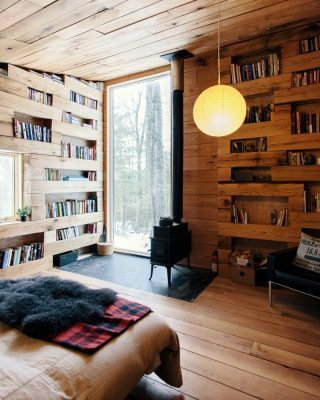 The SQUARE house is a bathing house located in Catskills, NY. 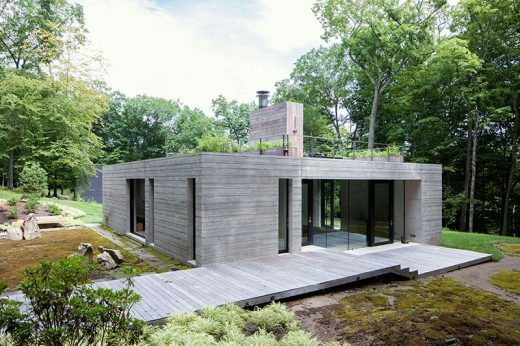 The house is a 43 x 43-foot square and is designed around the experiences of bathing and fire. A large cast-concrete fireplace anchors the building and fronts a sunken cushioned living room pit. 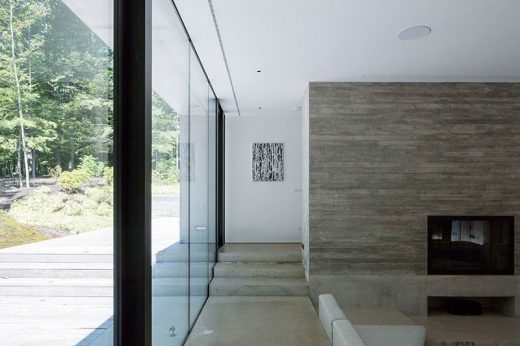 The house’s driving design approach bundles the programs of gathering, entertainment, bathing and a working studio within the framework of the square plan. The material approach of the project maximizes the sculptural and textural opportunities of cast concrete to create an immersive environment. 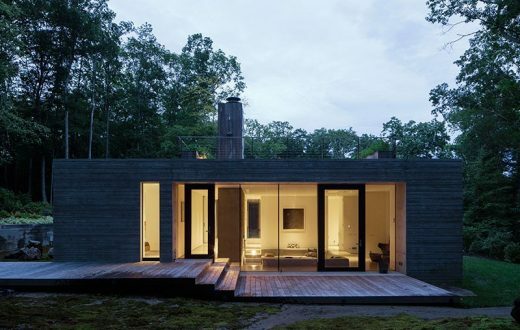 On the roof, views across the Catskills landscape are revealed and a planter garden enables herbs and greens to be grown and then washed in the outdoor sink protruding from the kitchenette through the glass on the floor below. 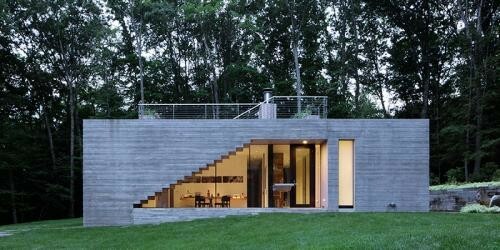 Offset Square Plan: The activity of conversation at the core of the house sets the pit at the center in a square. The pit itself is then set within a square room in a square house. Stepping: Following the slope of the landscape the house steps down from 8’-6” floor to ceiling in the bathing area, where primarily activities occur when sitting or sunken in the floor, to 10’-6” at the entry. The pit then creates a 12’ high space at its location. Layering + Casting: Modelling the form of the house in layers, then inverting the layers to become a negative mold, a horizontally striated model texture informed a board formed process for casting at the project site. 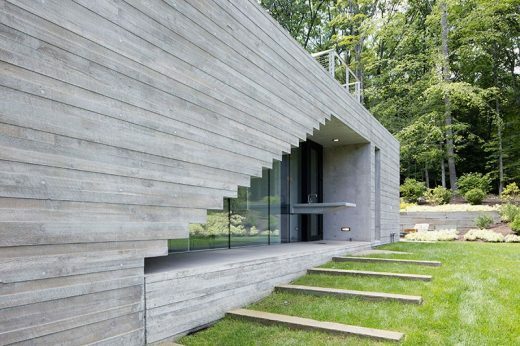 Formwork: Using rough sawn pine boards, the striated texture wraps the exterior of the building. The formwork was designed in negative to achieve the form of the underside of the exterior stairs and the rectangular door and window openings. Rough + Smooth: Smooth formwork was employed to create smooth transitions at the doorways and window jambs to play off against the rough texture of the board formed perimeter walls. Stair to the Roof Deck: A stair ascends to the roof where there is a garden and a viewing deck. Indoor Outdoor: All spaces of repose in the building contain large expanses of glass that tie the interior activities to the exterior landscape views and textures. Japanese Garden + Bath: The Riokan, soaking tub and steam shower are all tied together by a Hinoke (Japanese Cyprus) bench and enclosure at the tub, providing anti-bacterial warmth and softness to the bathing environment. General Contractor: Eric Glasser & Company Inc.